The name, Teddy Bear, is believed to have come from former United States President Theodore Roosevelt, who was commonly known as "Teddy". The name of Teddy Bear is believed to have originated from an incident on one of President Roosevelt’s bear hunting trips in Mississippi in the autumn of 1902. There were several other hunters competing, and most of them had already killed an animal but the President. A suite of Roosevelt's attendants clubbed, and tied an American Black Bear to a willow tree after a long exhausting chase with hounds. They called Roosevelt to the site and suggested that he should shoot it. He refused to shoot the bear himself and demanded the crew to release the bear at instance, deeming it unsportsmanlike, and swore to never go on a bear hunt again for the rest of his life. The story then became the topic of a political cartoon in The Washington Post, and later issues had made the bear smaller and cuter. The improved cartoon figure pleased the nation and the image of "Teddy's Bear" soon captured the heart of the Americans, as well as other people's attention from countries outside the United States. Apart from story I, another popular version of the background of Teddy Bears tells the story that during the years when Roosevelt served as the President of the United States, there was this unique event hosted in the White House that was significantly different from the other millions parties there had been: a set of lovely stuffed soft bear toys manufactured to represent various forms of occupancies, such as hunters and fishermen, were used to decorate the main guest table that night. The President quickly showed a special interest on these adorable cute bear toys as soon as he walked into the hall, and asked around for their names; however no-one at the party knew exactly where they came from, nor the name of their manufacturer, until some quick-witted guests came up with the answer that the bears ought to be called “Teddy Bears” after the name of President Roosevelt for this very special evening. Local newspapers soon took the answer as the hottest headline on the newspaper front pages the next morning - discussions about Teddy Bears became popular overnight throughout the United States, and these cute bears very soon became well-known to people from other nations such as Taiwan , Japan, England and other European countries. Teddy Bears are considered part of the Global Specialty Culture representing love, friendship and loyalty as a whole without any forms of language barrier. Strictly speaking, Teddy Bears should only be restricted to stuffed soft bear toys manufactured in the United States during the years of 1903-1912; but in the contemporary society, the name of Teddy Bears is already commonly used to represent all stuffed bear toys despite texture, colour, physical appearance, body size, fabrics used and the countries they are being manufacturered nowadays. There’s this very special lady in Taiwan who we respectfully called Teddy Bear Mommy, fell deeply in love with “Teddy Bears” since she was still a little girl that she began her journey in the search of her dream Teddy Bears at a very early age. Through a friend’s introduction, Teddy Bear Mommy was invited to her first dog talent contest, and all of a sudden her attention was drawn from the stage onto a bear-like creature that was held in the arms of a total stranger; she later found out the name of this beautiful yet rare canine breed to be "Teacup Poodles". Teddy Bear Mommy saw the beauty and magic in Teacup Poodles: their soft, fluffy hair, big round bright eyes and their adorable tiny bear paws have got her fallen madly in love with them ever since. She saw these Teacup Poodles in forms of the transformation of Teddy Bears, the one and only love of her life since she was young, and from that moment, she knew she’s finally found the Teddy Bear of her dream after so long, and better: They are ALIVE! These aren’t just ordinary Teddy Bears, they are living animals with souls, thoughts and feelings; not only that they come in different sizes and colours, they are also able to move, run, cry and laugh, and of as spiritual and extremely bright creatures they are, and if not being looked after carefully enough, these little Teacup Teddy Bears too would get sick occasionally just like human babies. It takes a large amount of time and human resources, beyond the outsider’s imagination, to successfully breed these beautiful Teacup Teddy Bears. Newborn Teacup Teddy Bears generally weigh only around 400 grams, and for a delicate baby of such petite body size, a strict environmental hygiene and temperature control along with complex nursery care procedures must take place in order to foster these Teddy Bears to grow into happy adults. That is to say, breeders will have to sacrifice more, leaving their personal lives behind, in order to facilitate Teacup Teddy Bears to develop into strong, healthy adult Teacup Poodles (Teddy Bears) under 24/7 surveillance. After years of nonstop hard-working, Teddy Bear Mommy finally established her first 5-Star Teacup Teddy Bear Breeding Center based on a wide range of professional knowledge and decades of hands-on experiences on Teacup Teddy Bears, which has made Formosa (a Portuguese historical name for Taiwan),this beautiful Pacific island, the world-famous origin of Teacup Poodles (Teddy Bears). Throughout the years, Teddy Bear Mommy not only soaks herself into the world of her beloved Teacup Teddy Bears but also insists on doing everything herself in terms of the nursery care for Teacup Teddy Bears; and with all the experiences she gained from breeding these beautiful Teddy Bears herself, she shares her love and passion for Teacup Poodles (Teddy Bears) by finding them a home sweet home in so many different families around our beautiful Mother Earth. What Teddy Bear Mommy sees in Teacup Teddy Bears is the unique characteristics of their purity, loyalty, honesty, empathy, and true-beauty; the idea of living with these wonderful lives already provides a huge amount of satisfaction to her, not to mention how happy she has been all these years spending every moment of her life with them. Teacup Teddy Bears are also her life mentors, teaching her the meaning of life and death at a much deeper level for her to appreciate every morning she wakes up, which also motivates and encourages her to pursuit continuous advancement in her mind, body and spirit. Her Teddy Bears, those of her darling angels, who run, move, cry and get sick exactly like human babies, have introduced her to a hole new era from the moment they met. The feeling is complicated and difficult to be put into words; and it’s no exaggeration when she declares that it surpasses the meaning of LOVE providing that Teacup Teddy Bears have introduced her to a world which barriers of space, time, culture and language no longer exist. Teddy Bear Mommy turned her secrete thoughts into real actions, and has been doing her best to share the unique experiences she gained from personally interacting with these lovely Teacup Teddy Bears to so many other poodle lovers, merely because she thirsts for everyone in the world to acknowledge the unconditional love these Teacup Teddy Bears are willing to offer to good families who love them back just as much, and many more countless advantages that owning a Teacup Teddy Bear brings. Teddy Bear Mommy has taken the things she learned from her Teacup Teddy Bears as her life-long responsibility to pass on this unconditional love to the rest of the world. Whenever there’s another Teacup Teddy Bear to be sent overseas to a new family, in a way Teddy Bear Mommy sees it as sending her sons and daughters to different parts of the world to get married; and every time she thinks of it like that the warmth of family love fills heart for her to happily wave goodbye to her babies as they depart. Furthermore when Teddy Bear Mommy receives postcards from those adopted families, through those personally written words from the letters sent from various families in different parts of the world she can actually feel the joy, love and satisfaction they have been getting since the arrival of their Teacup Teddy Bears, given that the family members are much closer and have been interacting with each other more often and so much fun and laughter are brought into the house and fill the home with so much LOVE because of these adorable Teddy Bears she bred and raised with all her love as her own babies. “So glad you said that”, Teddy Bear Mommy always replies with a light smile on her face. In pursuits for inner peace and ultimate spiritual satisfaction, Teddy Bear Mommy will continue to breed more beautiful Teacup Teddy Bears while continuously making improvements as well as advancements in the living environments she provides to her beloved Teddy Bears; the priority goal of Teddy Bear Mommy has always been giving all she has and more to her Teddy Bears for them to live a happier and better life. Indeed it is going to be a long road before the final accomplishment. ..Any thoughts or plans for Teddy Bear Mommy's retirement yet? Oh no, NEVER! Preference for Petite(Tiny) Teacup Teddy Bears in the 21st Century – Why? 1. Precious, delicate and sweet creatures with elegance. 2. Specialty pets are extremely rare in their kind. 3. Cheerful creatures bring so much happiness to people’s lives. Teddy Mommy was born on 1965.
as her companion as a young girl at the age of 19.
have to walk on the hot concrete floor with their bare feet. Teddy Mommy took care of her babies in every possible way she could. the house next door and turned it into a pet grooming center. 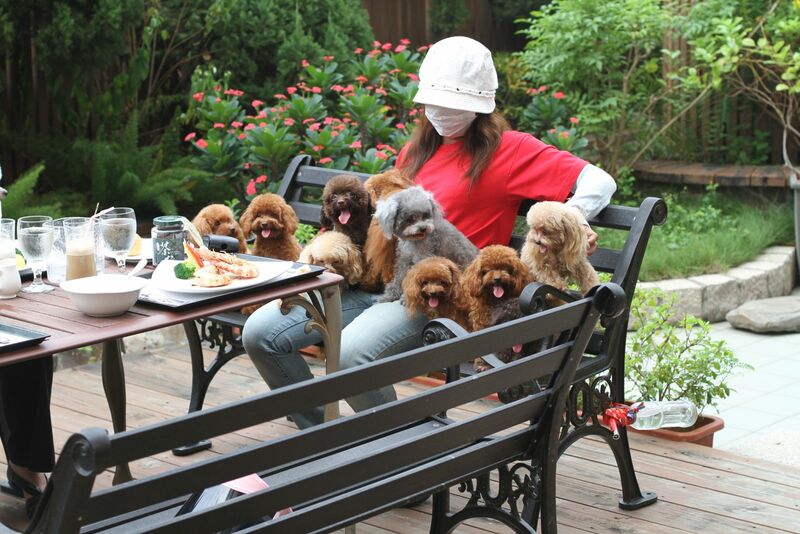 to have their pets serviced at Teddy Mommy's as a result. to be financially supported by direct foreign capitals. 30 years went past, this naive girl maturd into a woman. devote everything she has to the love of her life - poodles. 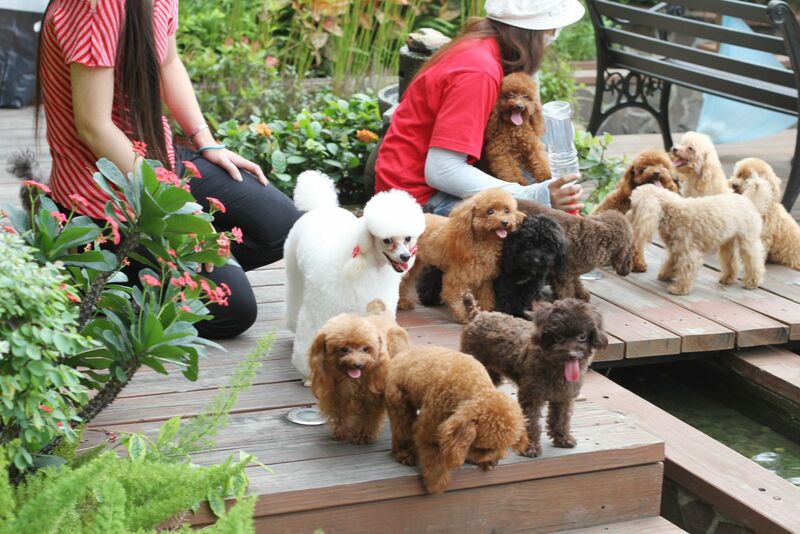 and the world's smallest poodle breed: Pocket Teacup Poodles. skills, knowledge and experiences about poodles. "Poodles are all that I live for!" 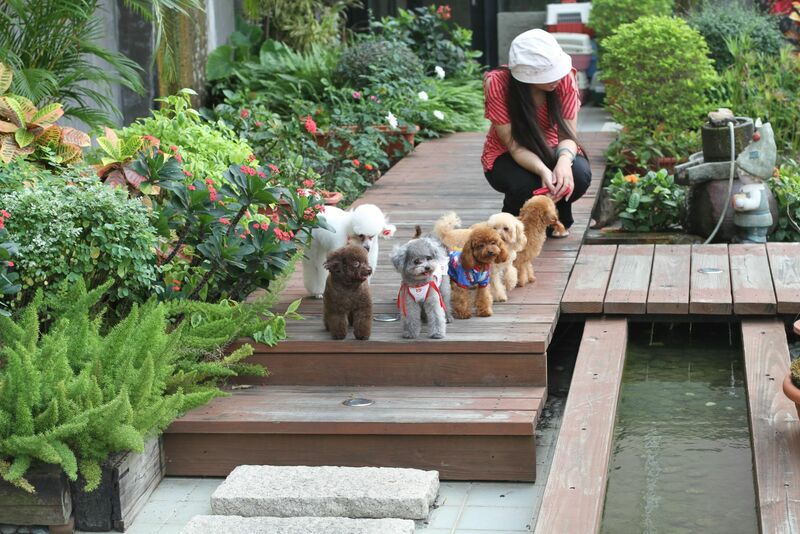 Even until now, Teddy Mommy is still on her own taking care of all her poodles. as she is already married to her poodles. the uniqueness and charisma in poodles like i do". value of poodles beyond physical appearance to the rest of the world. that support her mind, body and soul up until today. until the day of her funeral without a doubt. "Focus 120% on targeted poodle breeding schemes"
a lot has to be sacrificed in terms of personal needs and pursuits. providing poodles a better environment to grow up. for both humans and poodles. will never risk their chance and throw in all capitals on one single breed only. continue introducing new sires and dams into the group. and time has proven her right. and i look forward to the next 20 years to come." quality of poodles is her biggest motivation. ridiculous amount of time in dressing up or wearing expensive jewleries. new poodle sires and dams instead of making herself live a better life. Teddy Mommy often says that poodles are her family. for her poodles, rather than pursuits for the glorious. and see the difference in having a poodle in their lives. that are recognised as loyal, easy to train and learn fast. and those very rare silver (silver white) coat colours. are the three most common colour mix. and light weight in general. young couples throughout to big families with small children. needs a loyal and faithful life partner. "My love for poodles lasts for eternity"
because their ex-owners "got tired of having them". These poor, helpless little darlings once had a home, too. think about them as your own children, isn't it cruel to ditch them like that? abandoned animals will oneday become the problems of the entire society. *do you have any previous experiences in having a small dog? *have you talked to your parents about bringing a puppy home? before purchsing a poodle puppy from her. she does not mind if the buyers think she's a bit too "naggy". all that she cares about is to find good family for her poodles. poodles are live animals with thoughts and feelings. and the responsibility is on noone but YOU. you actually take one home with you! all teddy bear poodles are "cute" when they are still babies. but do you know how big they are going to grow into? how is their temperament going to be? any health warranty or guarantee in adult sizes? do you know how to hand-feed them if necessary? in terms of love, time and patience. every day and every minute of your life? most buyers did not know they come in different sizes. into the Taiwanese market from overseas. Small Toy Poodle, Toy Teacup Poodle and Teacup Poodles. with perfect body rations from the US and Japan into her poodle family. she also puts strictly high expectations on her staff. 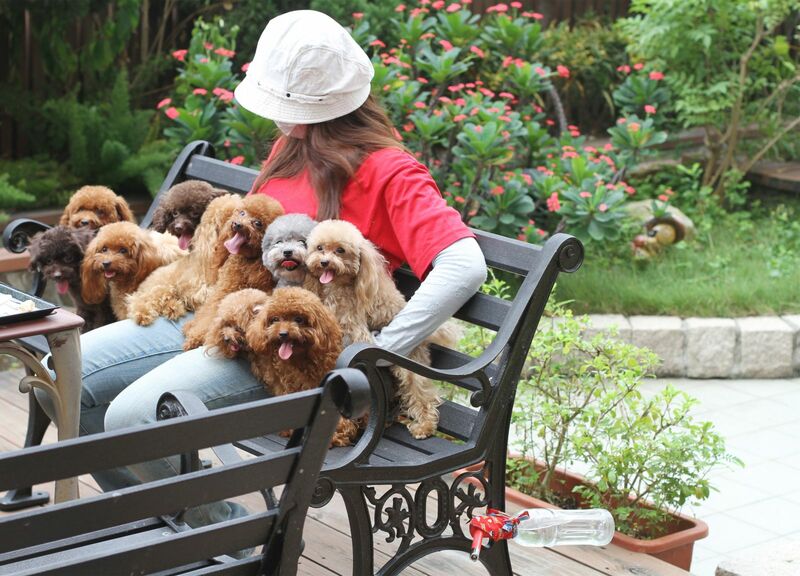 whoever does not have an extreme passion for poodles like Teddy Mommy. for a lower pay but easier work environemnt. A busy bee never stops being busy. they joke and laugh as usual every morning they wake up. we gained from these lovely poodles!" provide false information about poodles to consumers just to make more money or spread rumours about Teddy Mommy trying to bring her down. extra dollars on the poor quality dogs they bred. for about USD$2k and claimed it to be over USD$3k. like other champion dogs they read off magazines. the owner probably would not agree to sell anyway. 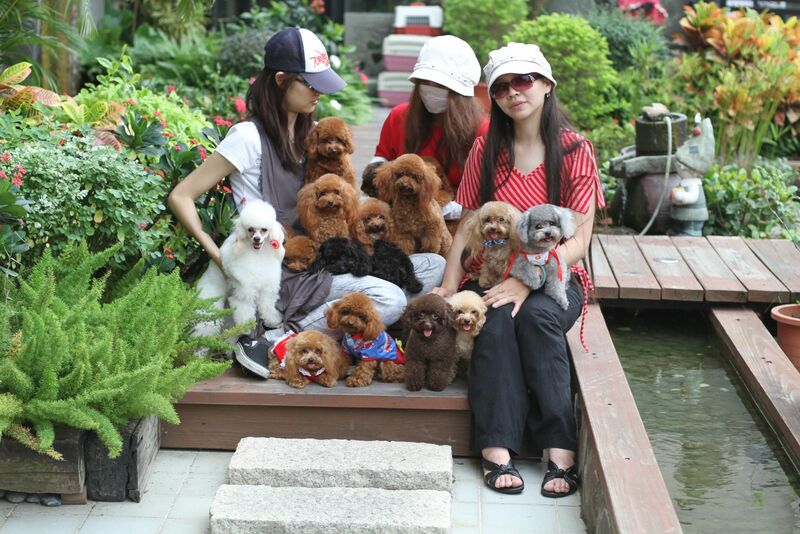 to purchase a teacup poodle for only USD$1k in Taiwan. do a full body check-up before performing leg surgeries on the puppy. pay over USD$3k for the leg surgery that did not have to take place initially. though Teddy Mommy sold her poodle puppies at prices much lower than that. high quality poodles eligible for internatinal dog contest standards. and it's even rarer to find teacup poodles with 1:1 body ratio. beauty comes with a price, and as for perfection, it's priceless. before purchasing a high quality (along with a high price) poodle puppy. compare us with other poodle breeders in those countries. 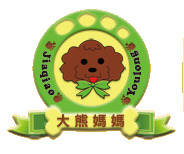 poodle quality we provide at YouLong Poodle Breeding Center. with their original owners. the average price is around USD$6500-10k. higher in price compared to others. false and nasty comments about her and her poodle breeding center. facinated by poodles as much as her. give herself a brand new, and poodle-free life. But Teddy Mommy did not think of it that way. so precious that money cannot buy. Teddy Mommy nursers her poodle puppies. combining quality poodles with a business that lasts for eternalty. 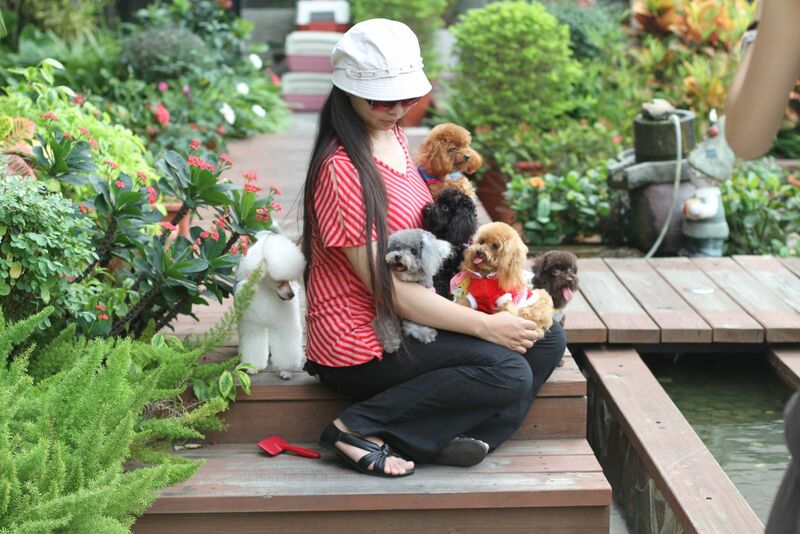 choose the best suitable family for individual puppies carefully. your dream puppy once you have come and visited our center.